If you think Kavanaugh will be our next Supreme Court Justice, then place your bets now. 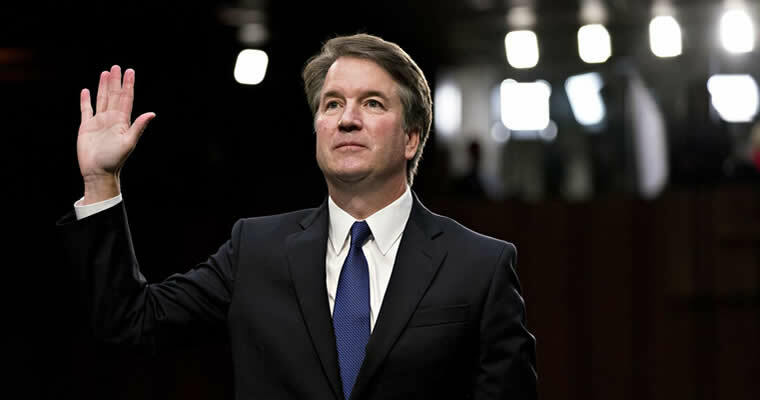 On Friday afternoon, September 28, 2018, sportsbooks are accepting political bets and opened the odds on “Will Brett Kavanaugh be confirmed as the next Supreme Court Justice?” at Yes (-170) and No (+140). With opening odds, a $170 bet on “Yes” wins $100, while a $100 bet on “No” wins $140. Bookmakers released the odds following the U.S. Senate Judiciary Committee voting 11-10 down party lines to advance President Donald Trump’s nominee to the floor for a full Senate vote on whether to confirm Kavanaugh to the Supreme Court. However, Senator Jeff Flake (R-Arizona) voted in favor of moving the vote to the Senate floor on the condition of the FBI launching a one-week investigation into the accusations made against Kavanaugh. This comes after the committee hearing on Thursday where Christine Blasey Ford and Kavanaugh both testified to the committee regarding Ford’s allegations of sexual assault at a party when both where in high school. Ford said she is “100%” sure it was Kavanaugh who sexually assaulted her at the high school party, while Kavanaugh vehemently denies the allegations made against him. Oddsmakers are siding with Kavanaugh, setting the line and making him the favorite to be confirmed as the next Supreme Court Justice. Several bookmakers pulled the original line this morning while the committee met at 9:30 a.m. ET before officially voting on whether to move the nomination to the floor around 2:00 p.m. ET. The line ended this morning at Yes (-350) and No (+275), making Kavanaugh a heavy favorite. Oddsmakers likely lowered the odds when the line re-opened due to the nomination not officially moving the vote to the Senator floor, since the deciding vote will likely fall on Senator Flake after the pending week-long FBI investigation he proposed has concluded. The odds had been fluctuating and flipping back and forth all week as two more women have come forward claiming to have been sexually assaulted by Kavanaugh many years ago. The line also shifted when many critics began to criticize Ford’s allegations for not being able to remember the exact time or place of the alleged assault. Kavanaugh not being confirmed became favored following Ford’s testimony at the hearing yesterday, but odds of Kavanaugh becoming the next Supreme Court Justice have been in his favor by several licensed betting sites since he began his opening statement after Ford spoke in front of the committee.